Curse those Lizardmen! With their scales, and the slime, and their...green-ness. In Hudson's upcoming WiiWare title, Shootanto: Evolutionary Mayhem you'll be able to put a stop to their lizardly tactics once and for all! 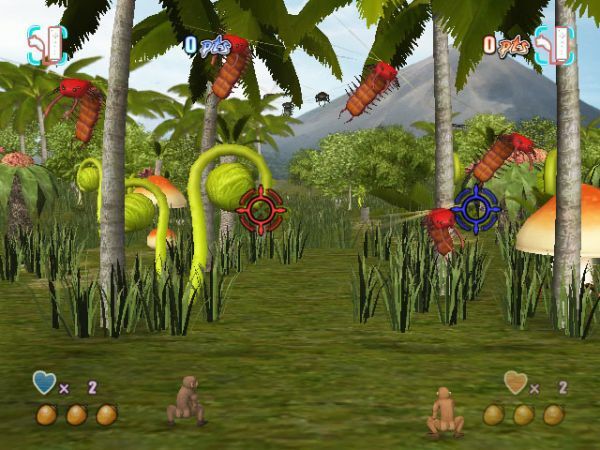 Hudson claims the game has a "unique" take on Evolution, as players work their way through numerous levels in light gun shooter fashion. You'll actually start the game as a monkey, and slowly evolve into a super soldier - which sounds perfectly normal to me. With two player local co-op support this looks to be a nice kid friendly diversion from some of the other more adult shooters on the Wii.